The traditional fare found at the dinner table during Hanukkah can read like a menu from the dreams of a delighted ten year old! Just look at all of those fried potato pancakes, sufganiyot (strawberry jam-loaded doughnuts dusted with powdered sugar), fried cheese-filled doughnuts dipped in honey, and delicious cheese blintzes! *** You’ll also need to soak approximately 5 cups of hickory (or apple) wood chips in water for about 1 hour beforehand! Okay, got it? Let’s get started! The easiest thing to do is get your mixes together. First, mix together your rub. In a bowl, add the kosher salt, paprika, brown sugar, black pepper, chili powder, onion powder, and oregano together. Mix well, and set aside. Second, get your “mop sauce” out of the way. Simply place all of the ingredients for the sauce – listed above – in a container, mix thoroughly, and set aside. Now, on to the brisket! If your cut of brisket has an extremely thick layer of fat on it, trim it down to a thickness of about 1/4″. Place the brisket in a roasting pan, and sprinkle with generous amounts of the rub. Massage the rub into the entire surface of the meat. Generally speaking, the rubbed-down brisket is ready to cook at this point, but it’s best to allow the brisket to cure in the refrigerator for between 4 and 24 hours. Just remember, the longer you let it cure in the rub, the deeper the flavor profile will be! While the meat is curing, it’s time to get your grill ready and set up for indirect cooking. Get your charcoal nice and hot, and then spread out across the bottom of the grill making sure to leave space in the middle. Now, place a foil roasting pan in the bottom of the grill, and ensure it’s completely surrounded by the hot coals. Allow the coals to cool to medium-low heat, and then toss 1 cup of the soaked wood chips onto the coals. Put the cooking grate on the grill, and go get the star of the show! Place the rubbed-brisket on the cooking grate, with the fat side up, directly above the foil roasting pan you put in the bottom of the grill. This will allow the brisket to cook over indirect heat. Now take the six slices bacon and drape them over the top of the brisket. Cover the grill, and allow the magic to happen. Throughout this whole process, you’ll have to add fresh hot coals & 1/4 cup of wood chips to the grill every hour in order to keep the heat even. You’ll have to allow the brisket to cook for approximately 5 to 6 hours, or until the internal temperature of the meat reaches 190F degrees. Once you reach that point, mop the brisket with the sauce you mixed up earlier. Make sure you thoroughly mop the sauce all over the surface of the meat. Now, CAREFULLY wrap the brisket in aluminum foil and allow to cook for another 45 minutes. Now, remove the brisket from the grill. On a cutting board, remove the brisket from the foil and allow it to rest for about ten minutes. Carve the brisket across the grain into thin slices. Transfer all of the sliced brisket to a serving platter, and drizzle with the left over “mop sauce”. There you have it! The process is a bit involved, but the end result will be well, well worth it! 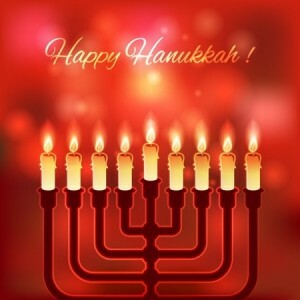 For centuries, the flickering lights of the menorah during Hanukkah have recalled and inspired courage and hope. So, this Hanukkah, why not display some courage of your own, step outside of the norm, and give this delicious brisket a shot! Steven Raichlen has won five James Beard awards for his cookbooks. High-Flavor, Low-Fat Cooking won the 1993 award for Best Light and Healthy Cookbook, and his follow-up, High-Flavor, Low-Fat Vegetarian Cooking, won the 1996 award for Best Vegetarian Cookbook. In 1999, Healthy Latin Cooking won the award for Healthy Focus. He also earned the 2001 James Beard Foundation/KitchenAid Book Award for his Healthy Jewish Cooking More recently his 780-page book, BBQ USA, won the 2004 award for Tools and Techniques.